Clockwise from the top: Chaqchan Mosque, Khaplu Palace, bank of Shyok River, Karakoram Range, Thogsikhar, Shyok River. Khaplu (Urdu and Balti:خپلو), also spelt Khapalu, is a town that serves as the administrative capital of the Ghanche District of Gilgit-Baltistan, in northern Pakistan. 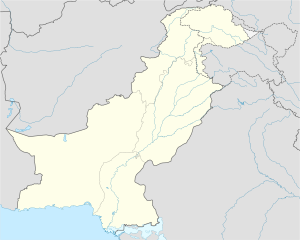 Lying 103 km (64 mi) east of the town of Skardu, it was the second-largest kingdom in old Baltistan of the Yabgo dynasty. It guarded the trade route to Ladakh along the Shyok River. The Khaplu Valley is 103 kilometres (64 miles) from Skardu and two hours by jeep. It is a sprawling village located at the confluence of the Indus and the Shyok Rivers in Pakistan. The first mention of the former small kingdom called Khápula is in Mirza Haidar's (1499–1551) famous work Tarikh-i-Rashidi (p. 410). The author lists the Khaplu district of Balti(stan). Khaplu was also very well known in the 17th and 18th century due to its close political and family ties with the royal family of the neighbouring country of Ladakh. The first European to visit Khaplu was probably Captain Claude Martin Wade (1794–1861), who mentioned "Chílú" in 1835 in a Journal of the Asiatic Society of Bengal essay. Subsequently, William Moorcroft and George Trebeck wrote in their 1841 book (Part II, p 264): "Kafalun is a province west of Nobra, on the left bank of the Shayuk." Godfrey Thomas Vigne has Khaplu 1835-1838, relying in particular on the local mountain fortress, commented that he was still in an intact condition vorfand (Part 2, pp. 317f). [clarification needed] Alexander Cunningham (p. 28ff), who did not visit Baltistan, published a brief geographical description of Khaplu and a genealogy of its rulers in 1854. Thomas Thomson travelled in November 1847 and briefly described a place of remarkable beauty for Tibet (p. 210ff). Knight reported on his visit to Khaplu (p. 253): "This fair spot what Kapalu, the richest district in Baltistan, and Regarded as a very Garden of Eden by the Balti people." Jane E. Duncan reached Khaplu in 1904 and stayed there for three weeks. A detailed report on her stay in Khaplu is well worth reading. [according to whom?] De Filippi, who reached Khaplu in 1913, characterized the site as follows: "It is, perhaps, the loveliest oasis in all the region." Further information on Khaplu was included in a travel report by Arthur Neve (p. 99f). Recent descriptions can be found in the guidebooks Arora, pp. 211f, Lonely Planet, pp. 306f and Beek, pp. 252ff. Khaplu lies at the base of the Karakoram Range. In contrast to Skardu and Shigar, the territory of Khaplu was not focused on a single large river valley, but was instead spread over the three valleys of Shayok, namely on the territory of the present town of Khaplu, the valley of Thalle River, and the Hushe / Saltoro valley. The area around the mouth of the river in the Thalle Shayok formed the western border of the kingdom. Today Gangche district, whose administrative centre is located in Khaplu, covers Balghar and Daghoni in addition to the mouth of the Indus in Shayok. It includes the former Kingdom of Kiris as a military bulwark of the West against the incursions of the archenemies Skardu and Shigar the mountain fortresses of Kharku were next to a castle in Balghar and saling been built. [clarification needed] In Haldi, in eastern Hushe / Saltoro Tal, was another fortress. The fortress in the town of Khar Thortsi Khaplu was viewed as militarily impregnable and the area's most important defence system. Khaplu has been called many names like "Shyok Valley," "Ghangche" and "Little Tibet." In Khaplu there are many historical places like the beautiful Chaqchan Mosque (700 years old founded by Mir Sayyid Ali Hamadani, the first Islam preacher in this area). Raja Palace is a beautiful building and the last and best Tibetan-style palace in Pakistan. Khaplu Khanqah is attributed to Mir Mukhtar Akhyar and was built in 1712 AD/1124 AH. Khaplu is the gateway to Masherbrum Peak, K-7, K-6, Chogolisa for mountaineers and Gondogoro la, Gondogoro Peak, Saraksa Glacier, Gondogoro Glacier, Masherbrum Glacier, Aling Glacier, Machlu Broq, Thaely La, Daholi lake, Kharfaq Lake, Ghangche Lake and Bara Lake for trekkers. Khaplu is a scenic place for hiking like Khaplu Braq, Khaplu Thung and Hanjoor, Kaldaq, Kholi, Ehli. There is rafting on the Shyok River and rock climbing places like Biamari Thoqsikhar and DowoKraming (hot spring). Khaplu is only approachable by road. The normal road route into Khaplu is by a link road from the Skardu Valley. There are four or five other road links to Kashmir and Ladakh. A famous all-weather Khaplu-Drass road linked Khaplu with Drass, a city in Ladakh. Since the annexation of Gilgit Baltistan by Pakistan, the road has been closed. However, nowadays there are a few helipads (helicopter landing pads). ^ "Khaplu — off the beaten path". Wikimedia Commons has media related to Khaplu.